When I finally admitted that I had been suffering with anxiety and depression late last year, I was in a very bad place. I had reached a point where I felt nothing but hatred and shame in myself. I felt like I was a burden to everyone around me and so I stopped speaking to people and only answered when they sent me messages, simply so they wouldn't be suspicious that something was going on. Whenever anyone visited my house I would put on my best smile and tell them all the great things the kids had done because they were the one thing that kept me going. They make my life worth living, they make it worth getting up every morning and they make me keep pretending that all is ok because I don't ever want them to think back and remember me being sad. If I have been quiet and have avoided conversation or have turned down invitations, it is not because I don't want to see you or talk to you. It is because I don't want you to see me like this. It is because I let everything get on top of me and let my anxieties beat me down. When I haven't asked to meet with you it is because even the school run has me on edge and the thought of getting on public transport where strangers can judge me makes me feel sick to my stomach. I know I have been an awful friend for so many reasons. I have no idea what worries or problems you have, what you have been enjoying doing when you get some spare time and I haven't been there when you need an outlet or you just fancy a chat. For that I am so so sorry. I am on the road to recovery but I still find myself pretending I am perfectly fine and I can never find a way to let the words leave my mouth when I am actually in anyone's company. It is going to be a long and tough journey and one that I will more than likely keep to myself still. I want to beat it though. I want to surround myself with the people I love and care about. I don't want to hide away any more because the more time I spend with my friends, new and old, I start to feel like me again and I long for the day that I can truly be myself and laugh and cry and be a normal human being around you again. Or as near to 'normal' as possible. We all have a little crazy in us. 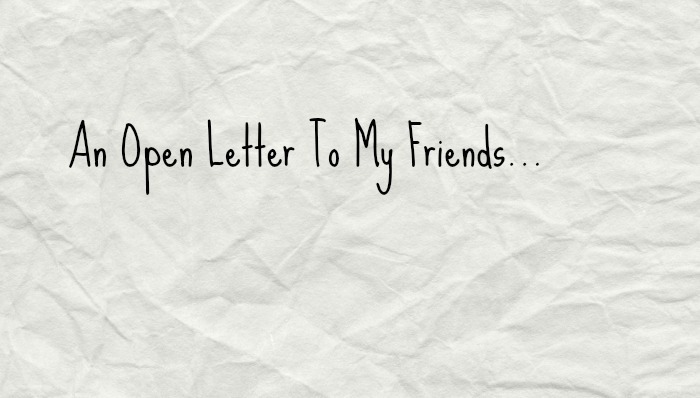 So the purpose of this letter is simply to say sorry and I appreciate and love you all. Even if I haven't shown it. Step one is writing things here, I hope your friends read this and I wish you luck with your journey, keep fighting to stay on the road to recovery. So proud of you for writing this Carly. I know how hard it would have been. You are an amazing lady, always thinking of others first. Now it's your turn, your time to be the most important person for a change. It is a long journey but one you don't walk alone, reaching out is a huge step now let us help you to continue it together.